Winter visitors to the summit are usually here to enjoy the skiing, sledding and other snow-related activities. The cold sterile white landscape of winter keeps our warm weather visitors away. After the snow melts, however, the warm weather crowd returns to the summit. A large proportion of that summer crowd is made up of the feathered varieties. 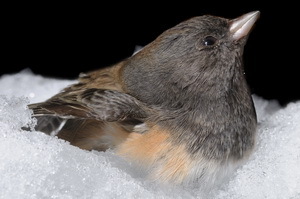 There are only a few hearty avian winter residents such as the Chickadee, Stellar’s Jays, Juncos, and the ever-present Ravens that brave the summit winters. haphazard nest that can create a fair amount of debris below the nest. Out in the forests the trees are alive with the calls of tanagers, warblers and the knocking of woodpeckers. This time of the year you can hear the deep whoop of the grouse as the males seek a female partner. The most abundant of the summertime crowd are the water fowl. Everyone is familiar with the large flocks of Canada Geese that frequent Van Norden lake and meadow as well as Serene Lakes. There is also a large population of ducks, mergansers and grebes that build their nests in the willows around Van Norden Lake. As we go through July it will be a common site on many of the summit lakes to see a mother duck leading a chain of ducklings around. You may also see what looks like an injured duck struggling in the water if you happen to get too close to a nest. Not to worry, it is just mom trying to distract you from here nest hidden somewher in the reeds. It is also not uncommon to see small flocks of the larger White Pelican especially on Van Norden Lake. These majestic birds are usually passing through, but they will spend a week of two here scooping up fish and tadpoles in the lake. They are pretty social birds that like to hang out together on the large rocks in the lake and also fly in V shaped formations high over the summit valley. The summit area does get it’s share of raptors also. 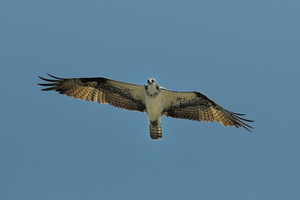 Red-tailed Hawks return in the spring and can be seen riding the thermals all over the summit area. There are also quite a few smaller Accipiters that can be seen winging near the crests of many of the peaks in the area. With all the lakes in the area, we have a healthy population of Ospreys that can be heard screeching as they hunt for fish over those lakes. 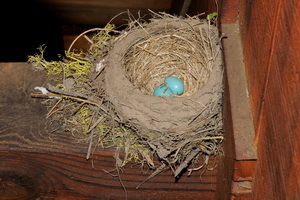 They make their large distinctive nests on the top of large trees out in the forest. If you are hiking in the forest you may hear the demanding screech of the hungry chicks. If your out canoeing, kayaking and/or fishing, you may see one swoop down and pluck a fish out of the lakes. Our most majestic visitor is of course the Bald Eagle. In recent years there seems to be an increase in the number of eagles in the area. Eagles have been spotted soaring all over the summit area and they too can be seen skimming along the surface of one of the lakes with their talons poised to capture a fish. As we enter into the heart of summer, make sure you take along a pair of binoculars with you on your next outing to better observe some of our avian residents. George – great bird photos – thanks for posting!!! Anytime you want company on a photo hike, ring me up.